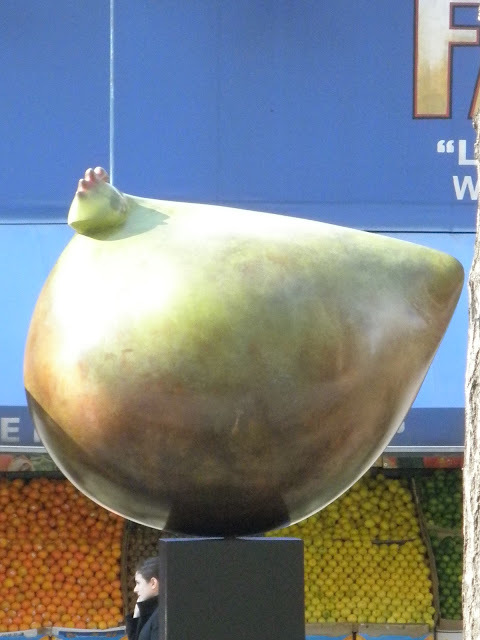 My Walking Pictures: Broadway Delights from Peter Woytuk (Again)! Broadway Delights from Peter Woytuk (Again)! 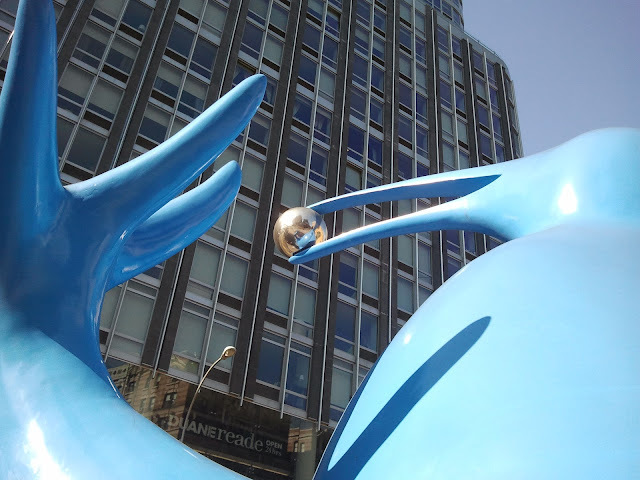 In my previous blog about the free public art in the city featuring Peter Woytuk's sculptures, I mentioned about the Hens which were missing from their place on 75th Street. 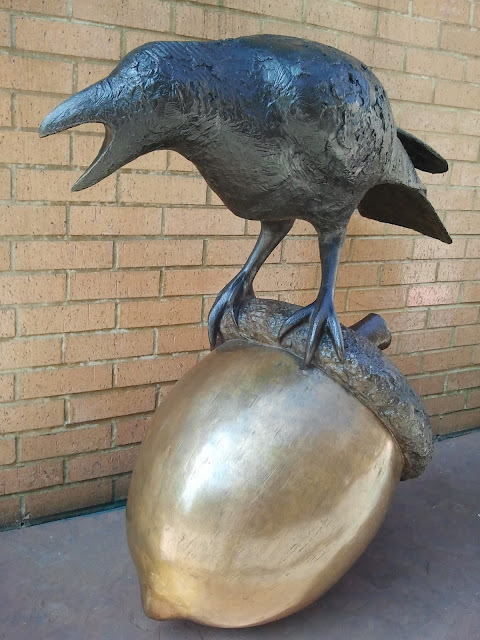 During the three weekends I spent walking to visit each of the sculptures, I tried to check out the Hens but never did get to see them. 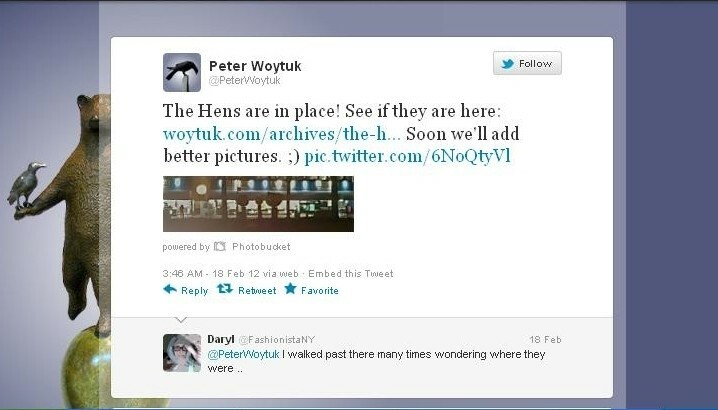 Last Friday, Peter Woytuk tweeted this .. I was excited to go see the Hens so last Saturday, I took a short walk from the corner of Central Park South (Fifth Ave and 59th Street) cutting through the Park diagonally and on to where the Hens are at (Broadway and 75th Streets). 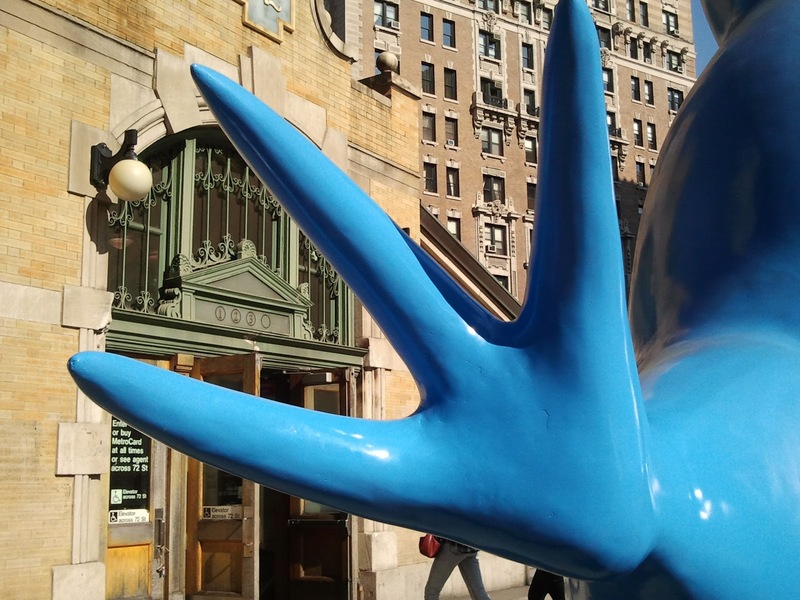 However, I wanted to see A Kiwi again so instead of going straight to 75th Street, I headed to the 72nd Street subway where the big blue Kiwi is and took some shots. I also took a shot of one big blue foot ..
and the blue beak with the silver ball against the big blue sky. 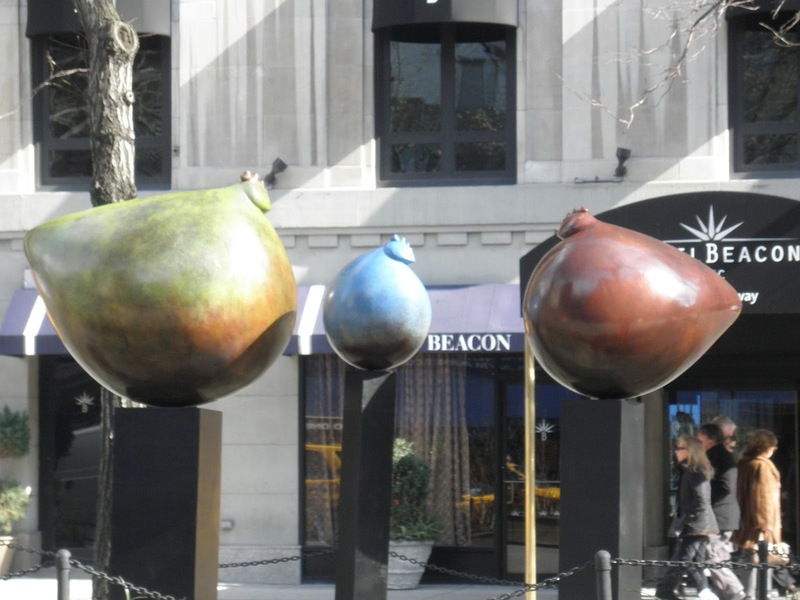 Then it's on to the Acorn Bench which is just a block away. Wasn't able to take a pic of the whole bench as there were people sitting on them. 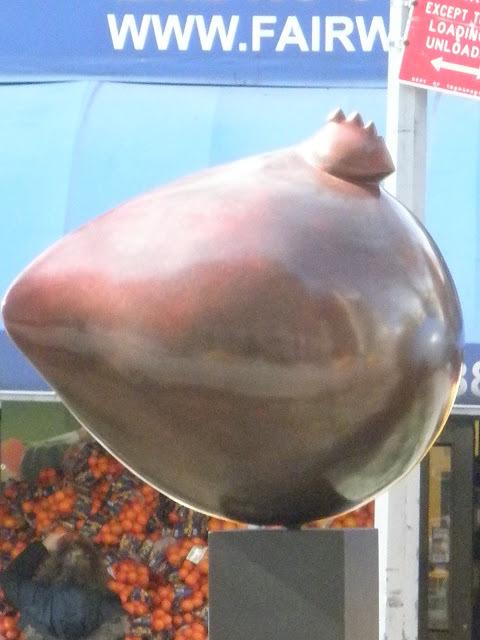 I just took a couple of pics ..
including a close-up of the acorn. Then it's off to the Hens! Here's my first view of them. So plump and cute! 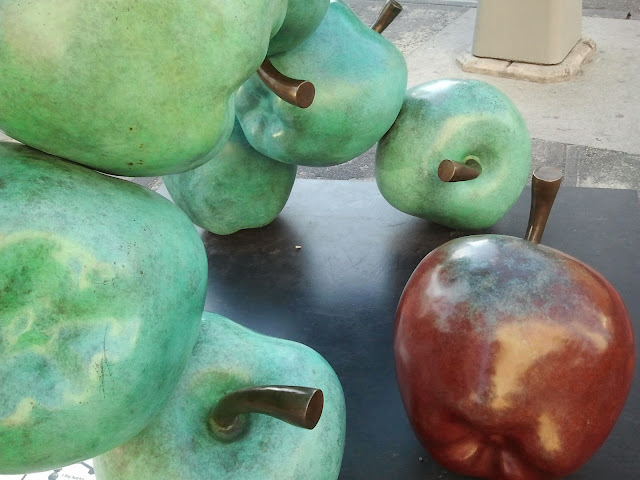 They were along the median so I crossed the street as they seem to be facing the other side. 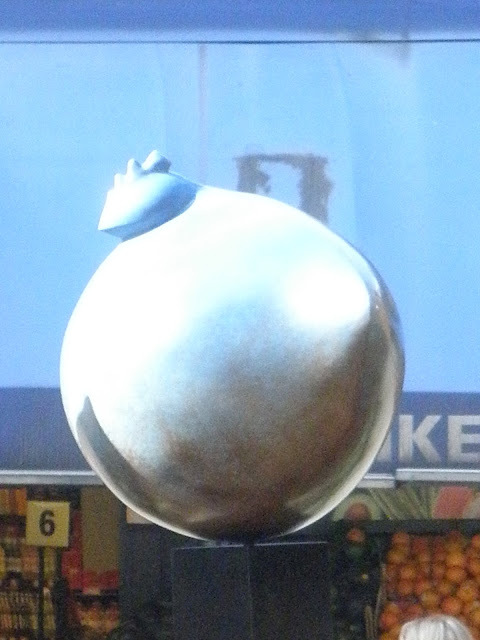 Here are a close-up pics of each of them. This blue one is the baby Hen .. 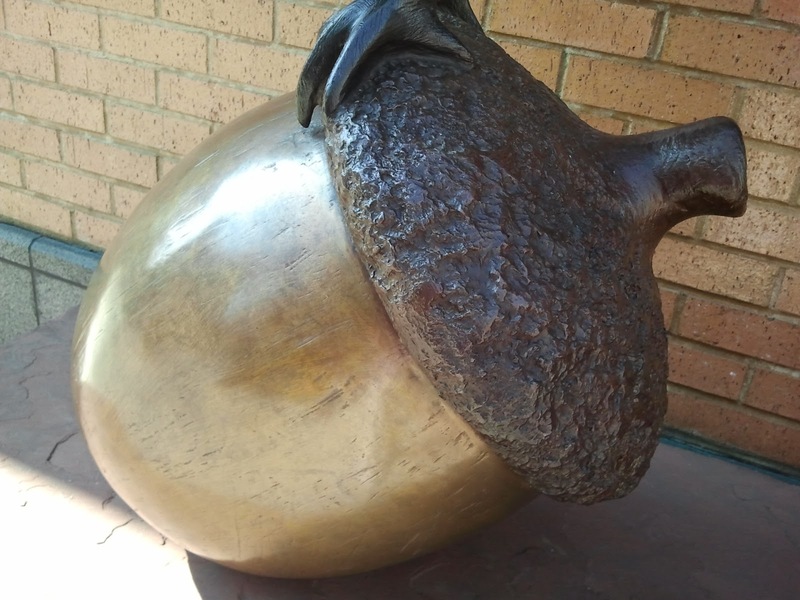 I call the red one Mama Hen..
And the largest one in yellow is Papa Hen ..
Today we only have half-day at work so I took the extra time to visit two of the sculptures as I only took one pic each before. 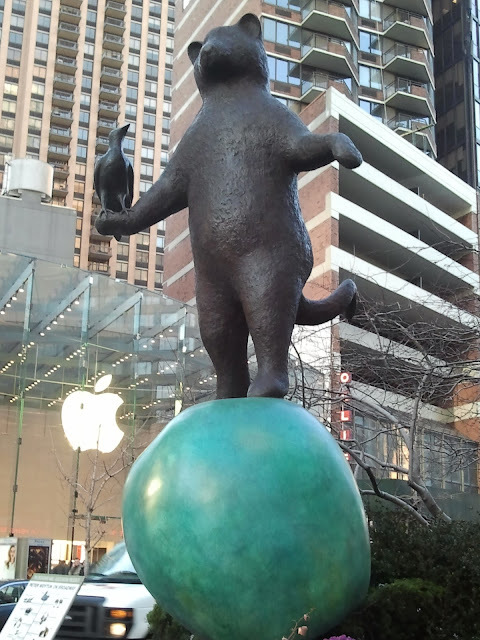 So here's a new pic of Falling Apples ..
and the Bearcat balancing on an apple near the Apple store. 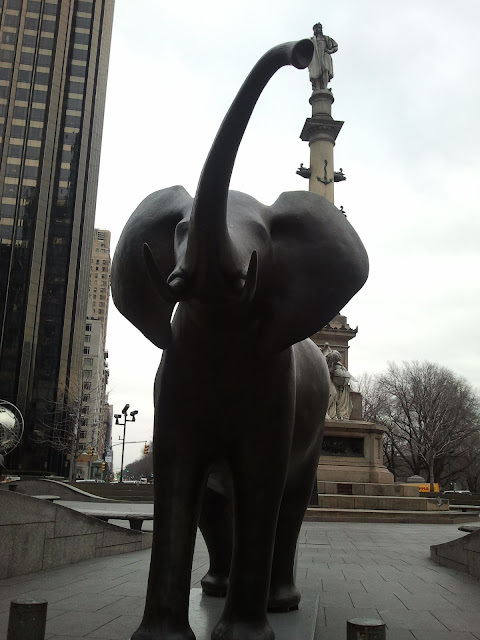 The weekend before last, I was able to drop by Columbus Circle and took some pics of the Elephant Pair. Here's one of them trying to play with Christopher Columbus. 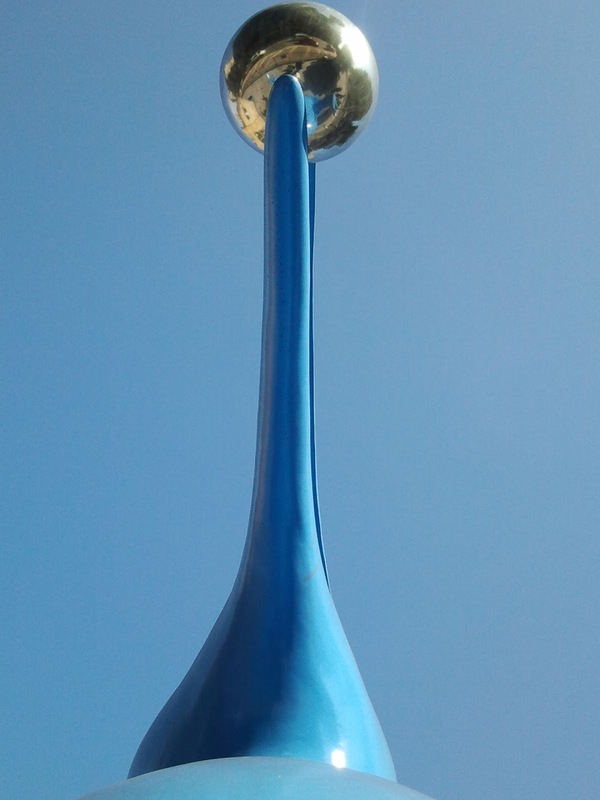 And the other one seems to be a favorite of the kids. 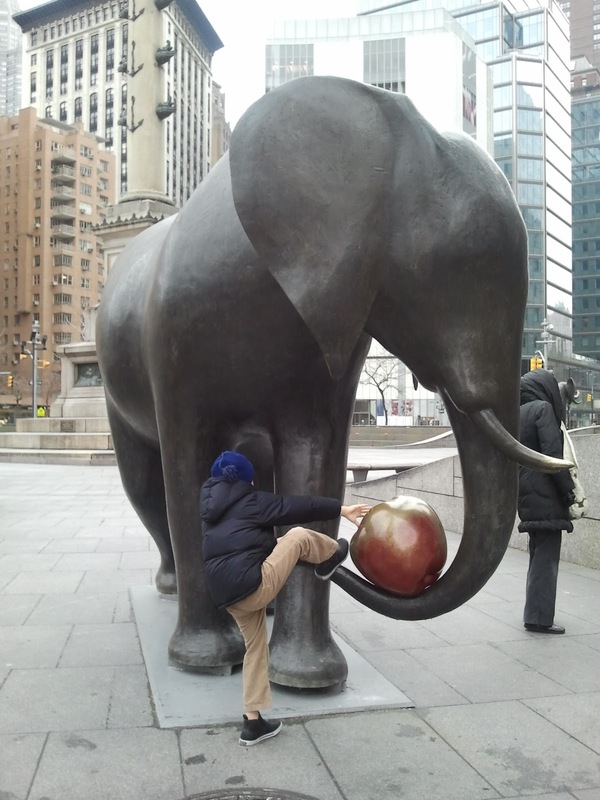 The apple on the elephant's trunk has lost a little bit of its red color with all the playtime it's getting from kids and adults alike. On that Saturday afternoon, one little guy was trying to climb and ride on the elephant's trunk just as I was taking the shot. I had fun, too! 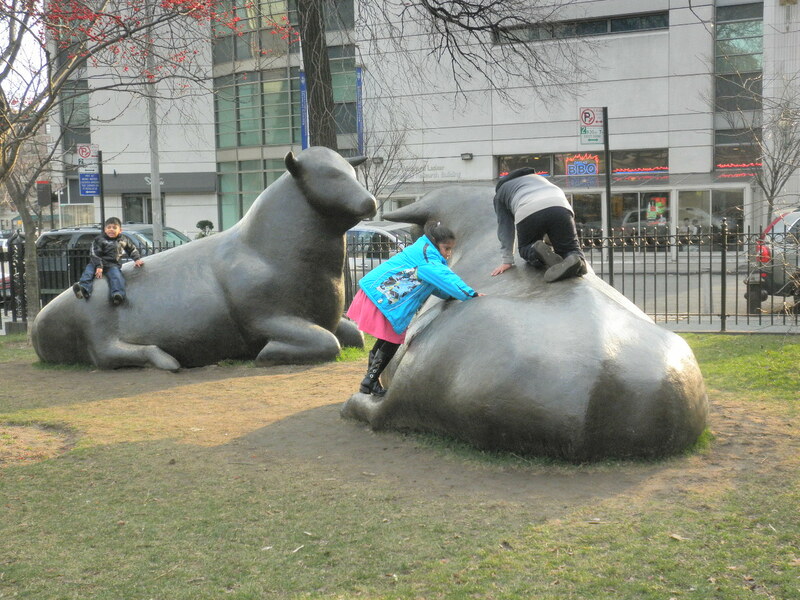 The sculptures are a hit especially with the kids. From the Elephant Pair above up to the Two Bulls 109 blocks away ..
Everybody's having a great time enjoying the sculptures. 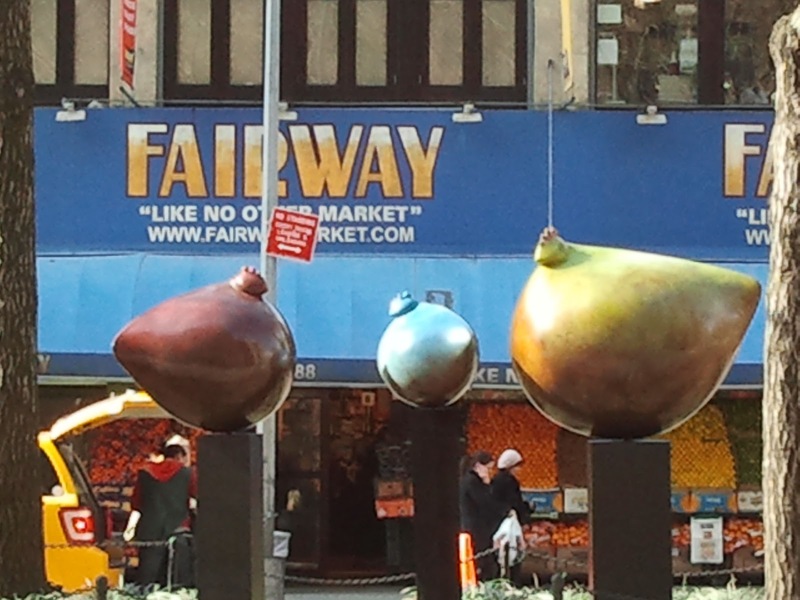 Thanks again to the Broadway Mall Association, the New York City Dept. of Parks & Recreation, and the Morrison Gallery of Kent, CT. for the exhibit, and to Peter Woytuk for creating the wonderful pieces. Each one is truly a delight! The rest of my pics of the sculptures are in my albums on Picasa and Flickr. Check them out!